The undersigned is directed to say that the CCS (Leave) Rules, 1972 have been amended vide Notification G.S.R. No. 438 (E) dated 03.04.2018 (copy enclosed) to bring them in conformity with the Rights of Persons with Disabilities Act, 2016. Accordingly, it has now been decided that leave applied under rule 20, shall not be refused or revoked without reference to the Medical Authority, whose advice shall be binding. Further, any leave debited for the period(s) granted after receipt of the certificate of disability of the Medical Authority, shall be remitted back into the leave account of the Government servant. 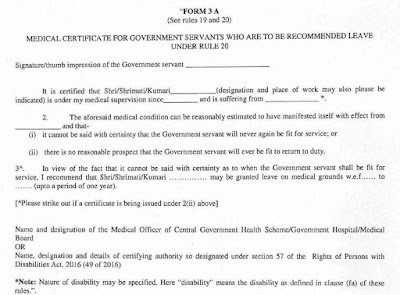 The Certificate of Disability is required to be issued in Form '3A' which should be signed by a Government doctor of a Government medical board. 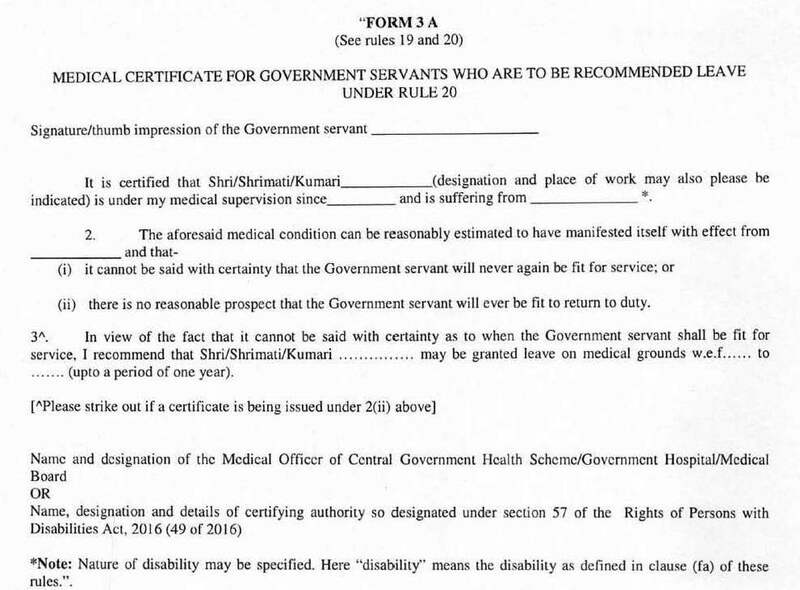 Further, a Government servant who is granted leave in accordance with the provisions of clause (b) of sub rule (I) of rule 20 of CCS (Leave) Rules, 1972, the provisions of section 20 of the Rights of Persons with Disabilities Act, 2016(49 of 2016) shall, suo-motu, apply.